In 1996, a company called Black Dragon Press released a game that combined the features of a collectible card game with those of a traditional table top role playing game. This game was called Dragon Storm. As an exercise in game innovation, it was an interesting concept. As a game, it left something to be desired. 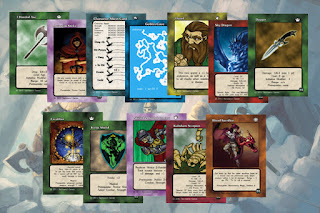 While the game mechanics underlying Dragon Storm were functional -- some might even argue that they were good -- the "collectible" aspect of the game made getting a complete set of cards for the game more difficult than was reasonable. Of the 270 cards in the base set 90 were common, 90 were uncommon, and 90 were rare. It was expensive to get a complete set back in the 90s, now it is nigh impossible. The use of cards in character creation and game play was a novel idea, but the random/collectible aspects doomed the game from the start. Last month Sacrosanct Games released a role playing game that uses the best features of Dragon Storm, while leaving out the collectible component. The game was funded by a successful Kickstarter campaign that I wish I had gotten in on. Their new "role playing card game" Compact Heroes is a card based game that is customizable -- in that you can buy expansions -- but which is not collectible in nature. In this way, Compact Heroes has done Dragon Storm one better. But is Compact Heroes a good game? Is it worth spending $30 for the Master Set starter set? Is it a complete game from the get go? The answer to these questions is, as you might imagine, yes and no. The game is playable, and you get a decent amount "toy factor" for your $30. The problem is that the game is overly simple and seems somehow incomplete from just the Master Set. It needs more "umph." Let me explain. Character creation in Compact Heroes is a simple affair. You pick a card for your race. Your choice of race will provide you with a bonus to one of your five basic attributes (Strength, Agility, Endurance, Intellect, and Luck). These can all be seen on the character sheets. Strength adds to damage. Agility adds to your "evasion" value. Intellect gives you a Power Rating for spell casting and a bonus to hit with spells. Luck gives you a value you can check against to make "luck checks" to avoid certain effects. A roll equal to or lower than your luck means you succeed and avoid some ill effect. Players then have two additional points they may distribute among the 5 attributes as they like, giving the starting character a total of 3 points in 5 attributes. Once the attributes are selected, players may choose one skill (humans get two) that their character begins with. This can be something like "Novice Dodge" which requires an Agility of 2 and provides an additional bonus to evade, or Novice Combat which provides a bonus to hit or damage. Once that attributes and skill(s) are selected, the player rolls 5d6 to determine wealth. This yields an average of 17.5 gold, which isn't a lot of money for starting equipment...but there isn't that much equipment to choose from. Needless to say, starting characters are very much beginners. They aren't helpless, but they aren't highly skilled either. A nice feature is that what skills a character can take are limited only by statistics and prior skill choices -- many skills have prerequisites. There are no "classes," but logical choices are beneficial. Combat in Compact Heroes couldn't be simpler. After initiative is determined, a character may make one attack on his or her turn. The attack is resolved by rolling a d20 and adding any bonuses to hit from skills or magic. If this number is higher than an opponent's evade, the attack hits and damage is rolled. From this damage, a character's "damage absorption" value is subtracted. This damage absorption value is usually provided by a type of armor ranging from Clothing to Gothic Plate. The system combines the d20 to hit system with an armor damage reduction system. As I have blogged before, there is really no difference between having armor make some one harder to hit or having it reduce damage as both are part of a linear equation that can be balanced so that armor has the same effect regardless of which method is used. Damage = (((20 + to Hit Bonus - Evade) x .05) x Average Weapon Damage + Bonus) - Damage Absorption. Note that the base number here is 20 rather than 21 as in D&D. This is because a roll equal to evade is a miss. Each point of evade lessens damage by 5% and each point of Damage Absorption reduces damage by one full point. Depending on the weapon the percentage effect of Damage Absorption varies. Allow me to illustrate an example. Sojan is a starting character who has a Strength of 1 and an Agility of 2. He has the Novice Combat (+2 to hit and +1 to damage) skill and the Novice Dodge (+2 to evade) skill. He is wearing Clothing (Damage Absorption 1) and wielding a Long Sword (1d6+2 damage). Sojan is fighting an Olekmar Goblin. It is a level one creature, so should be okay for a starting character if the game is designed well. The Goblin has +0 to hit, an Evade of 10, Damage Absorption of 1, and does 1d6 damage. Sojan's total to hit bonus is +2 and total damage bonus is also +2. His total evade is 14. With these attributes, Sojan does an average of 3.5 damage per round against the Goblin. In return, the Goblin does a damage per round of .05 points to Sojan. This is because Sojan hits the Goblin 60% of the time, thus his damage per round is 60% of his average damage. The Goblin only has a 30% chance to hit Sojan and his average damage is less. Needless to say, Sojan can fight more than one Goblin at a time. Given the Damage Absorption values of some armors (as high as 8), I don't know why they chose to use a Damage Absorption system. Once I started looking at combats as linear equations, the need for Armor to "reduce" damage became an unnecessary abstraction for me. If a game wants to use such a system, I prefer Dragon Warrior's armor penetration roll...a roll that follows the to hit roll...or a system like the Warhammer Fantasy Battles "Armor Save" instead of a flat number. Your mileage may vary. Needless to say, Compact Heroes' system isn't new but it is tried and true and many do like it. The only caution I would add is to not go overboard when setting Damage Absorption values. The game also features attribute checks, which can be modified depending on the selection of skills a character has, where a player rolls 1d6 and adds a bonus for appropriate skill or stat. The game master sets a difficulty and you must roll equal to or higher than the difficulty number. There is little to no guidance regarding what appropriate difficulties are. I like the simple skill system, but I'd like more specificity. Characters don't have levels, even though monsters do. Instead, they earn experience points at intervals determined by the game master. Each experience point may be spent to either increase an attribute or purchase a skill. I like this system, it is simple and reminds me of Hero/Champions. My only criticism is that no real guidance is given regarding how often xp should be given or what an appropriate level of advancement is for the game. Yes, this can be group driven...and should be...but some guidance would be nice. It adds a rich setting with thematic intellectual property. The game isn't enough, you need fluff. The lack of fluff on the cards is a weakness. The game needs a rulebook that is longer than 3 pages and that contains recommendations and examples. The game needs some adventures...and fast. The game also needs to reduce the almost random quality of the artwork. There are some stellar cards, but there are some very mediocre ones as well with regard to artwork. More skills, more spells. There are not enough spells for long term play in the starter set. They need to sell "adventure decks." 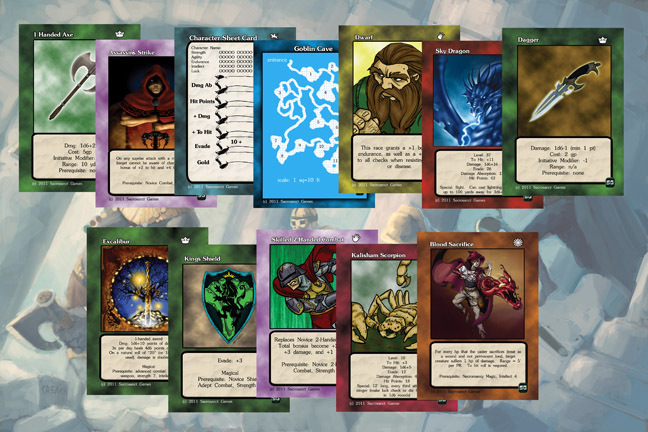 A small deck of cards that features monsters, npcs, and skills that are all thematically related. These need to have flavor text. I'm going to give the game a try with my group, but I do want some more substance. I'll likely start with the adventure in the Master Set and then run the adventure on their website. Where it goes from there, I don't know. I can see how random adventures could work. Or generating adventures randomly. You got this adventure deck and draw certain number of cards in order. Then you just write down how the cards are related to each other. Basically these adventure cards would be encounters (combat, location, npc for example). Some roleplaying games have these random adventure tables where you roll dice. Who - what - why - where - reward. About the game how you described it. It sounds more like beer&pretzel than real rpg you would play.